It’s time for another weekly update from our irregular schedule. I’ve skipped the last few, due to the relative frequency of Tool news lately, with both Adam and Danny indicating in recent weeks that things are happening. I’m sure you’ve all read that before – let’s wait until they actually confirm hitting the studio before getting too excited. NAMM is the worlds biggest music trade show (I think) where pretty much all the big time manufacturers show off their latest gizmos. Justin Chancellor dropped into the Warwick/Framus booth, to play some sweet riffs on his custom axe. Maybe some of these will appear on the new album? 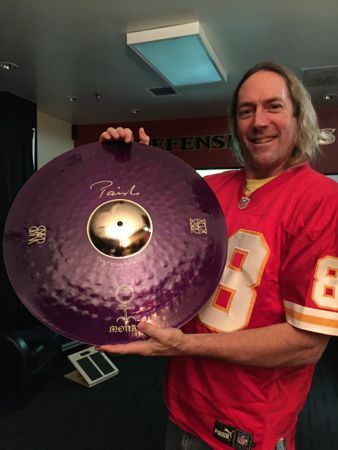 Not to be outdone, NAMM regular Danny Carey played a massive gong in the Paiste booth. In other Justin news, he contributes to the track Oni Przyszli by Polish band Glaca. I believe this band is fronted by the same guy he worked on with m.t.Void. The vocals are somewhat of an acquired taste, to put it mildy. Enjoy it if you can! Anvil – Pounding the Pavement: Canadian heavy metal act Anvil were the subject of a popular documentary a few years back, and while their music is pretty cliched, I found their latest album to be reasonably enjoyable. Chelsea Wolfe – Hiss Spun: Chelsea puts out an interesting twist on doom, and her albums are always sonic adventures worth checking out. Corrosion of Conformity – No Cross No Crown: These guys put out some consistently good hard rock/metal albums, and this one is no exception. As you can see from the photo below, it’s a great looking cymbal, so if this kind of stuff is your thing then keep an eye on the Paiste website for details! So, you guys are back in writing mode right now? Yes…Justin, Adam & I are working on some stuff and Maynard will join us in another month or so, once he finished up with his ‘other band’. We’d like to get in the studio by May or June and holpefully get our new record done by the fall…we’ll see how things go. Right now, we’re throwing riffs around and seeing what feels good. So far, it’s turning out to be a bit more on the heavier side…Adam is really rockin’ out, so it’s exciting. I’m a big fan of heavy Tool, so that works just fine for me. Thanks to Mike for directing me to the interview! Update: You can download a PDF copy of the magazine here.